More than a dozen companies, including Google, Apple and IBM, are no longer requiring applicants to have college degrees, CNBC reports. Degro took the course and earned the badge that turned out to be a way to list his new skill in an online resume with a digital graphic that looks like an emoji. Such non-degree credentials have been growing in popularity. Thousands of credentials classes aimed at improving specific skills have cropped up outside of traditional colleges. Some classes are boot camps, including those popular with computer coders. Others are even more narrowly focused, such as courses on factory automation and breastfeeding. Colleges and universities have responded by adding non-degree programs of their own. some 4,000 colleges and other providers issue industry certifications, according to the Lumina Foundation, but fewer than one in 10 are reviewed by a regulatory body or accreditor. That companies need trained employees is uncontested: More than three-quarters of U.S. manufacturers told the National Association of Manufacturers this year that they had trouble finding and keeping skilled workers. Despite those hiring and retention concerns, industry appears reluctant to discuss the topic of policing new credentials. The National Association of Manufacturers declined to answer questions. Badging programs are rapidly gaining momentum in higher education – join us to learn how to get your badging efforts off the ground. During this session, you will learn how to ask the right questions and evaluate if badges are a good fit within your unique institutional context, including determining ROI on badging efforts. 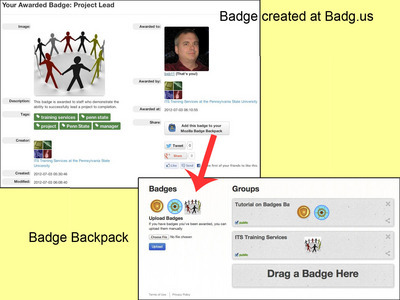 You’ll also learn how to assess the competencies behind digital badges. This session will allow for greater understanding of Open Badges standards, the variety of technology software and platforms, and the portability of badges. We will also explore emerging trends in the digital badging space and discuss campus considerations. What does the business model look like behind existing institutional badging initiatives? Are these money-makers for an institution? Is there revenue potential? Where does funding for these efforts come from? Badging can be a catalyst for partnerships between higher education and industry. In this session, you will have the opportunity to learn more about strategies for collaborating with industry in the development of badges and how badges align with employer expectations. Now that we have a better idea of the “why” and “what” of badges, how do we market their value to external and internal stakeholders? You’ll see examples of how other institutions are designing and marketing their badges. Alongside your peers and our expert instructors, you will have the opportunity to brainstorm ideas, get feedback, ask questions, and get answers. Most institutions are getting into the badging game, and we’ll talk about the far-reaching considerations in the world of badging. We’ll use this time to engage in forward-thinking and discuss the future of badging and what future trends in badging might be. and learn the strategies and processes that other institutions have used to develop digital badge initiatives and programs. You’ll learn the different ways that badges can add value to the learner experience, key considerations for developing badges, and how to effectively connect learners to industry. Your instructor panel for this event is an impressive lineup of experienced speakers, all from higher ed themselves, who have been immersed in this work and have likely seen and overcome the same challenges you have. Come ready to learn from the experts. The Washington State Board for Community & Technical Colleges (SBCTC) is teaming up with software development company Concentric Sky on a digital badging initiative that will use Badgr digital badges to document professional development accomplishments of faculty, administrators and staff across the system’s 34 institutions. Each college will be able to implement badging as well as guided pathways within their courses or programs, particularly for co-curricular activities that typically aren’t represented on transcripts. Examples of such programs include internships, community service and museum activities. he platform is certified compliant with version 2.0 of the IMS Global Learning Consortium’s Open Badges Specification. With Badgr Pathways, badges from Badgr or any other Open Badges compliant platform can be stacked to create “learning pathways” that are shareable across institutions. As part of the four-year project, SBCTC will also contribute to the Badgr open source project. Guess what … I searched for Brenda Perea (in hopes of maybe getting some information on how they set up their system) … One of her current positions is with Credly … Do we still want to reach out to her? Nearly 2/3: Institutions that cited alternative credentials as an important strategy for the future.